We started our fourth discover by singing All I once held dear and prayer. Afterwards, it was time to learn our second memory verse, which was taken again from Psalms. As before, the words were made to gradually disappear as the verse was repeated. Hopefully more will have remembered it than for the previous verse. After some children’s choruses we sang Open our eyes, Lord before the children adjourned for their classes. For those who were left, Alan read the reading from Mark 15:22-39 before David came up to speak on the fourth of our six weeks of Christianity Explored. His subject this week was The Cross: Why did Jesus die? Today at #discover, we're looking at 'The cross: Why did Jesus die?'. Why do Christians make the cross the centre of their faith? 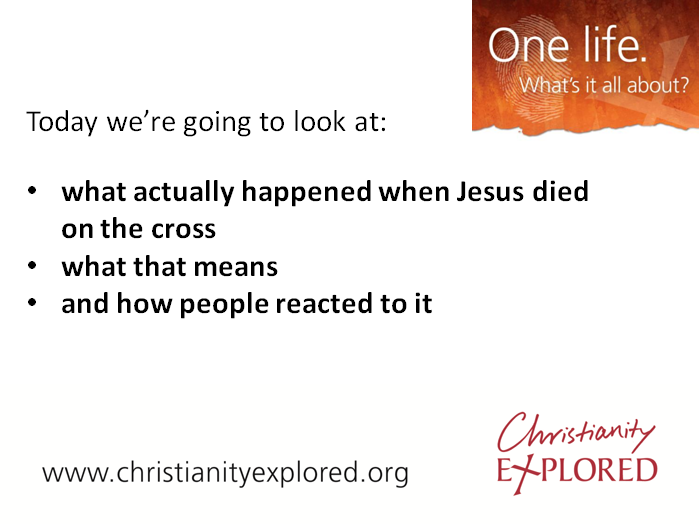 Today, David will look at what happened when Jesus died on the cross, what that means and how people reacted to it. Mark 10:45 tells us that Jesus came to the earth to die. Darkness in Mark 15:33 was not an eclipse. This was caused by God's anger. Verse 34 gives the reason: 'My God, why have you forsaken me?'. God is angry about our sin. But God's anger fell upon His Son Jesus who took our sin upon Him, on the cross at Calvary. Mark 15 37-38 tells us that when Jesus died, the curtain of the temple was torn from top to bottom indicating there is a way back to God. Jesus took our sins on Him and paid the debt that was ours, when He died on the cross. We now have access back to God through faith. Those who crucified Jesus cast lots for His clothes. His death was nothing special to them. What about us? The chief priests and teachers of the law were happy with their teaching. Pilate knew what was right but went with the flow. How about us? The centurian in Mark 15:39 realised that Jesus was the Son of God. We're left with a choice. Will you keep your sins or take them to Jesus? You can download David’s talk by right-clicking on the link below and selecting ‘Save link as…’. Alternatively, press the play button to listen directly from the website.